Oh I do love the taste of yogurt. To me it is a soft ice cream sitting in the frig calling my name. I have been told to up my calcium intake, enter yogurt in it's best form EVER. I mak e it. Right here at home, twice a week with no special additives. So simple and so much better than any store or name brand. I choose to make vanilla flavored yogurt. Fruits or jams could be added... but I prefer the silky smooth scent of vanilla. The yogurt maker is the key. I chose the Euro Maker, as it was the brand that I saw most often in stores and online. It had the individual cups instead of one large container. Best yet, the cups are identical to the glass jars that are used for bouillon cubes. So I recycled 7 jars and had enough for a double batch. The other special purchase besides the maker is a meat thermometer. 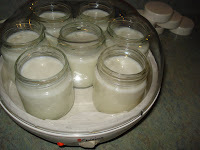 The temperature of the milk is the key to yogurt and that transformation from pourable milk to spoonfuls of yogurt. Time and patience are required in this simple recipe. Start this early in the day. In a microwaveable 1 quart measuring cup, put 4 cups of milk in the microwave and bring to 204 degrees. Times vary from oven to oven, for me it is 9 minutes on the nose. Remove from oven and check the temperature with the meat thermometer. 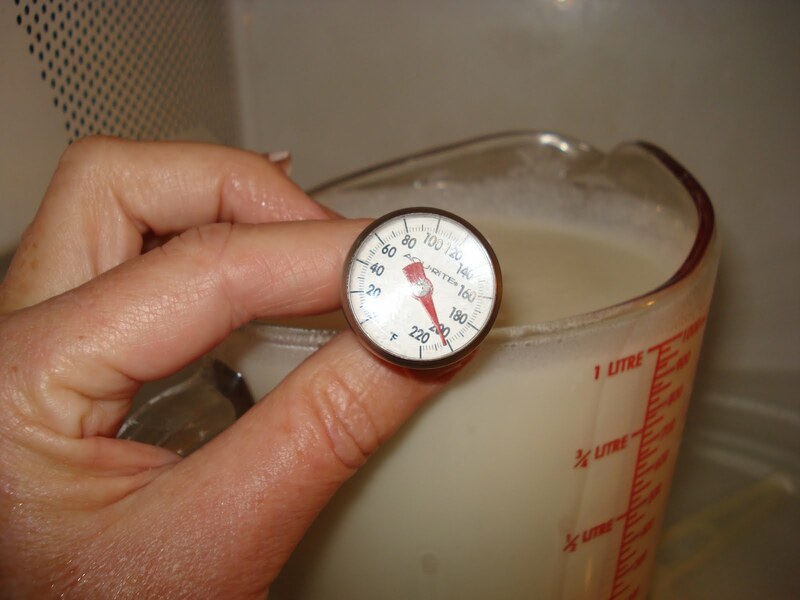 Arriving at the right temperature is easy to spot, as the milk starts to climb up the sides of the measuring cup - not to a boil yet. When you have the right temp, remove the skin that forms on the top, pour into a large bowl and add one scant 1/2 cup sugar and 1 t pure vanilla extract. Let sit on the counter until it comes to room temperature. Add one 6 oz container of store purchased yogurt, any flavor. Stir until well mixed. Pour into the individual 7 containers. Turn the maker on, register the time in your mind and add 7 hours to that. That is your DONE time! You see it does take all day, but it is worth it. Put these in the refrigerator for a healthy snack. Be aware that before you know it, you'll be doing this again! Instructions may vary from maker to maker. 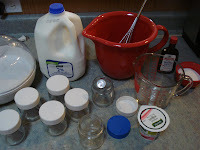 I do not use powders, and I can use one of my own made yogurts to make the second batch... but only that batch, the bacteria which turns the milk to yogurt is only strong enough for one use. Enjoy and try variations in flavors! Just like all of the store types, the variations are only as limited as your mind. This homemade yogurt is a great dessert for me since it is not high in sugar (which I need to avoid). The taste is wonderful and I like to add some walnuts, a touch of cinnamon, a bit of coconut or berries or all of the above!